At six in the morning, we don’t see too many other dogs on our walks. At least once a week we’ll pass by the home of the marshmallow of a canine below and we always stop to say hello. I may or may not slip her a few pieces of kibble at the same time. Could you blame me? She – or he, I guess I don’t know for sure – is such a sweetheart. Typically I avoid dogs behind fences but this dog approaches so softly and with such a low, sweeping tail, that I never felt any reservations about approaching. I just wish I could figure out what mix of breeds she is. Newfoundland, perhaps? Her fur is mostly black, except for her front paws and legs which are a light brown. She is about the size of a Newf or a Bernese Mountain Dog. She/he looks friendly and has lovely eyes. I’d have said Newfoundland as well, but crossed with??? Yeah, I’m a little bit confused too about the crossing idea. But no doubt that she is a Newfoundland. Official guess: Leonberger. Could even be purebred Leo. I would guess that too, except for the eyes which look yellow or amber rather than brown. I’m with you guys. Maybe it’s a Leonburger-Newf! OMG! What an absolute cutie pants! I definitely see newfie (and the chill-axed nature is pretty newfie–ish). What a sweetheart and a good poster dog for the mixed breed. I agree Newfoundland and maybe Labrador. Hmmm…it’s a cross all right but I’m not sure what breed. Looks friendly. How does Shiva react? Looks like Newfie/Leonberger to me. Beautiful dog! Isn’t it nice to have a calm dog behind a fence? Most of the time, all the dogs are lunging at the fence and barking their heads off when we walk by…craziness! What a beautiful fence friend! awwww looks very sweet. 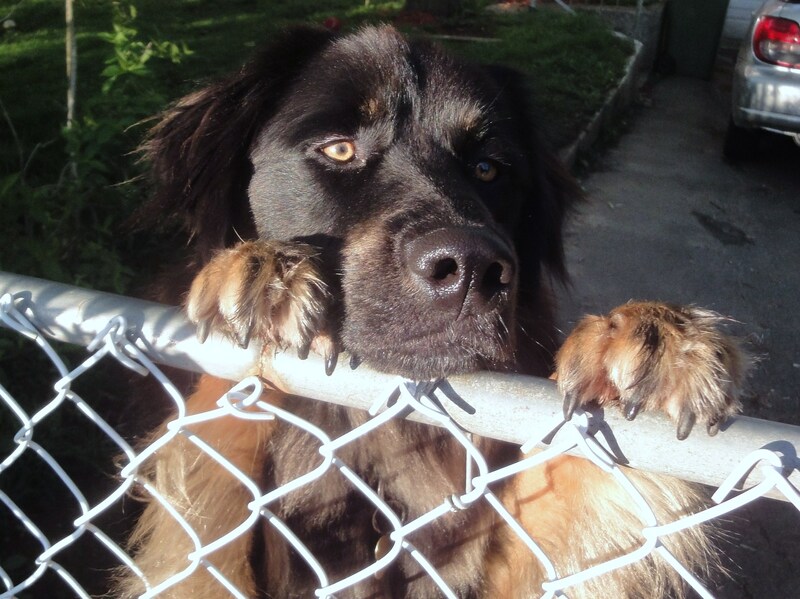 I agree with all the black, thick long fur newfie or a relation looks to be part… Agree too that it might have some Leo in it, but usually that shows up on the face more. So maybe a Leo/Newf/lab? 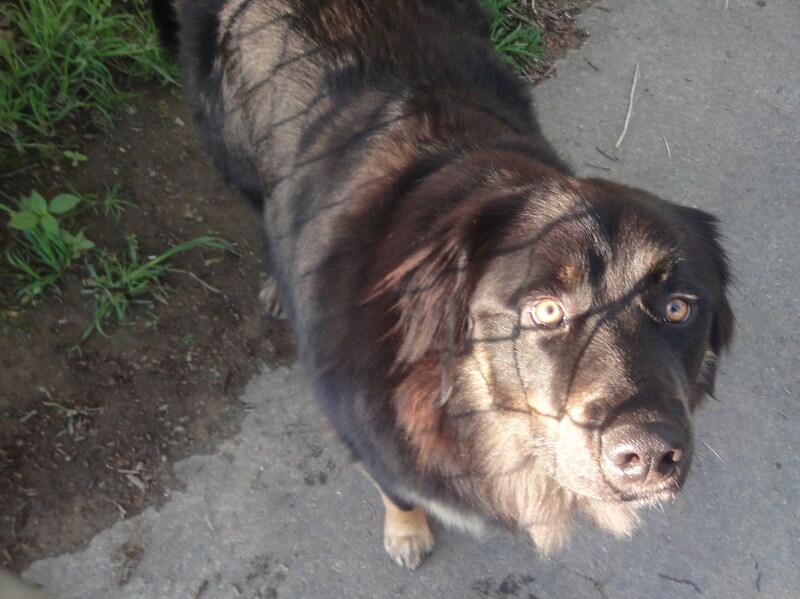 Pretty thin face for a newfie/leo. We have a calm, friendly Newfie by our house too! I use him/her to practice non-reactivity with my dogs and he/she is always happy to stand up, walk up to the fence and not react to my crazy dogs. Makes me want one someday! I see Newfie in her face and Leo on her legs! Whatever she/he is, she is definitely adorable! What a sweetie! Let me guess … you’re not running into his/her owners to ask them at six in the morning? =D How does Shiva react? I couldn’t comment yesterday, but I love your fence friend. Very pretty dog! I honestly have no guesses, but the Leonberger could be right. So could Newfie, so who knows? I used to greet other dogs on my walks with my client’s dogs and some I would sneak some kibble to them too. In fact, we had one Lab/Husky mix who would bark if we passed her by! I enjoyed the dogs who were friends at the fence. That dog is SOOOO cute! Oh he’s so cute and very meek. My heart was so touch by the looks of that dog, he/she is such a sweetheart. He/she is such an adorable dog. That’s really no mix of any kind!! that’s an HOVAWART!! The most clever, gorgeous and loving breed in the world! !